Chipmunks are cute and entertaining little animals in pictures and cartoons, and most people enjoy watching them run around their yard. They’re so cute and quirky – who couldn’t help but love them and want them around? Chipmunks are part of the Rodent family, and considered to be agricultural and horticultural pests when they eat gardens and destroy plants and shrubbery. When Chipmunks are present in larger numbers (and their numbers are always larger than you think) they can cause significant structural damage by burrowing under patios, stairs, retention walls, garage aprons and foundations. In your garage, storage building, or home they cause enormous problems and even put your family in severe danger by eating electrical insulation and building nests in your walls. If you notice sunken sidewalks, burrowing holes near the foundation of your house, or sudden and unexplained electrical problems, you could very well have a chipmunk infestation that needs to be addressed immediately. 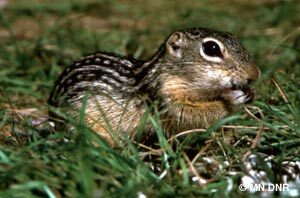 The professionals at Minnesota Wild Animal Management are experts in Chipmunks infestation removal and Chipmunk prevention. With their many years and vast experience in the pest control industry, the professional exterminators at Minnesota Wild Animal Management know where to look and what to look for in solving your problem and ridding your property of the infestation. And not only will they solve the immediate problem, they will take the appropriate measures necessary to see it does not happen again.